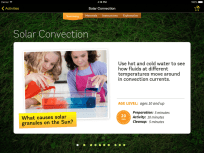 DIY Sun Science is a fantastic app for letting students explore the natural world. Full of activities and information, this free app lets users check out the solar system. It’s a great choice for teachers looking to bring more hands on instruction into a science unit or locate informational text to supplement a lesson. Teaching science with iPads? Check out my lesson plans!